Kirsty Aitken is the latest artist to exhibit in the Small Gallery at Aberdeen Royal Infirmary. Hidden Depths is inspired by the natural world, reflections in skies and water, the play of light and Kirsty’s imagination. 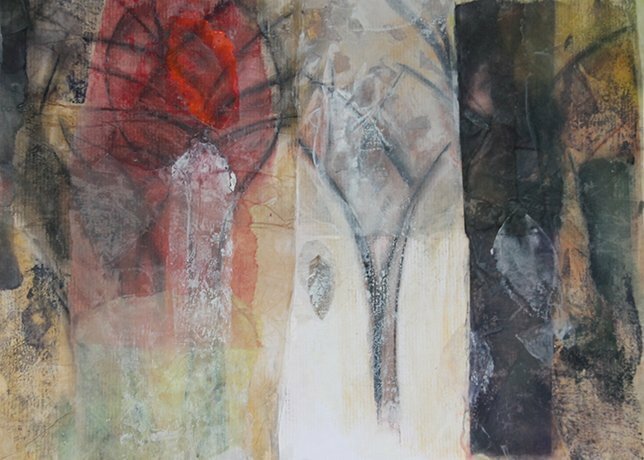 She creates rich layers of colour and texture by using an experimental approach with her materials. Kirsty is captured by the beauty of natural landscapes, trees and skyline while reacting to the colours, patterns and textures which generate visual and emotional responses. This latest selection of work is a result of her travels through Aberdeenshire. Kirsty has been passionate about art all of her life. She graduated from the Scottish College of Textiles in Galashiels in 1989 and continued her exploration of textiles during a Postgraduate degree at Glasgow College of Art in 1989. Kirsty then trained as a teacher in 2003 so that she could share her passion for art by teaching innovative art projects to children. She has worked on a range of projects teaching art across the curriculum throughout Scotland and has worked with Aberdeen’s Reading Bus since 2007.